Kayak fishing season is here, and this form of fishing has never been more popular. But if you’re getting into kayak fishing, there are lots of tough decisions to be made when selecting a kayak. What’s the best fishing kayak for you? Should you aim for a cheap fishing kayak while you’re starting out – even a used kayak – or something more expensive? Do you choose a fishing kayak with pedals, or go for paddle power? What other kayak fishing gear will you be using need, and what’s the best kayak fishing setup? Over the last several years, more and more anglers have chosen kayaks instead of powerboats given their lower cost (purchase, insurance, fuel), ease of transport, launching flexibility, stealth, equipment options and shallow water penetration. As you look at getting started with kayak fishing this season, follow these simple rules when buying a kayak! Even though a good kayak is far less expensive than a powerboat, advanced models can get pricey; ranging up in cost beyond USD 3,000. There are two basic types of kayaks – sit inside and sit on top. Sit inside kayaks are a poor choice for fishing since water will stay inside until emptied, they are difficult to recover if flipped, and cargo space is severely limited. A sit on top kayak is the best choice since any water from waves or flopping fish drains quickly out of the scupper holes in the bottom. Their open design allows easy access to cargo as well as room to mount accessories, like a kayak fish finder, on utility tracks. Finally, if you intend to fish with a child or friend, consider a sit on top tandem model. Some tandems can be configured back and forth from two seats to one. If possible, attend a kayak demo day and paddle or pedal in multiple kayaks to determine the best comfort fit. Check the legroom. Will the seat adjust to allow paddling or pedaling with a slight bend in your knees? Nestle your back into the seat to validate its comfort since you will be sitting in it for hours and hours. Ideally, the seat should be elevated to keep your bottom dry and above the water that is sure to splash into the boat. Unless you like to swim, stability is critically important. Given the need to twist and turn to cast and land fish, the boat must not be “tippy.” If you intend to stand up while fishing, avoid a V-shaped hull since these the tip easily. Look for a tunnel or flat bottom hull. The minimum width for a fishing kayak is approximately 30 inches or 76 centimeters – more is better… up to a point. A broad, short boat will be sluggish. Also, short kayaks can get tossed around easily by waves; something you will appreciate the first time a fast-moving powerboat throws off a massive wake. On the other hand, longer boats cut through the water smoothly – that’s why touring kayaks are long and skinny. Therefore, pick the right width and hull type for stability and then find the longest model you are comfortable transporting. As fishing kayaks add more features, they become heavier. Be sure to understand how you will move the kayak before you buy it. Will it sit on top of the roof of your car? Carried in the bed of your truck? Or do you need to buy a trailer? Never compromise safety! Until you fish for a season in a kayak, you will not truly understand what you like, what you hate and what features are useful where you fish – river, lake, or ocean. Most kayak dealers have used kayaks available for sale. Also, Craigslist and other online sites have plenty of options from anglers who followed this rule and are moving up to a new kayak. Therefore, use the first four rules to pick the best used kayak that meets your requirements. Fish from it for at least one season and then decide about keeping it or replacing it. 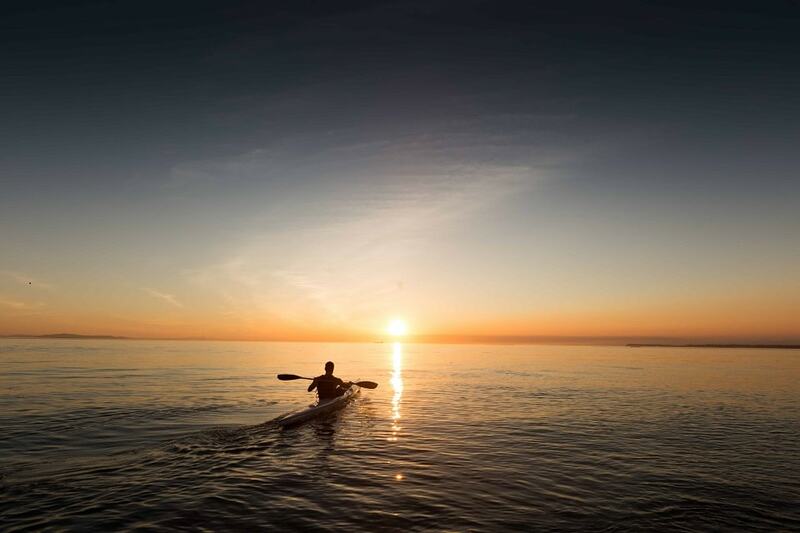 • Regardless of whether you buy a paddle or pedal driven kayak, be sure to size the paddle to account for your height, the width of the boat, and your paddle style (high or low). Your kayak dealer can help with the math associated with those three variables. • Kayaks come in many different colors, and the good news is fish don’t care and will not be spooked. However, if you fish on water crisscrossed by fast-moving powerboats, a brightly colored kayak will keep you safer than a camouflage pattern. If this is a concern, yellow, lime and green colors are the most visible. You can always overcome a dull colored kayak by wearing a bright, reflective vest. • Be sure the kayak is accessory friendly. It must have adequate space for utility tracks to attach rod holders, fish finders, cupholders, camera mounts, and all the other fun accessories that make a day fishing more enjoyable. As a final point, get recommendations from friends for a trusted kayak dealer who is more interested in putting you in the right boat than making a big sale. Use the rules as the conversation outline to discuss all the options, pick the optimum choice, and join the enthusiastic crowd of anglers heading for the water in a comfortable, safe boat!